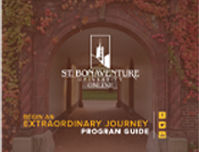 St. Bonaventure University is located in New York state, but its online degree programs are available in several cities across the country including Grand Rapids, Michigan. St. Bonaventure was named one of the nation’s best college values by Kipliner’s Personal Finance. Professionals, students and those looking to grow their career can get an MBA from St. Bonaventure Online. Our AACSB-accredited online MBA program can give a boost to your resume, and more importantly, can give you the prowess to make ethical decisions and succeed in a fast-changing business world. Our online MBA students go on to be leaders in everything they do. The online Master of Business Administration program is available for Grand Rapids, Michigan residents and uses a 7 week term format, with two terms in each semester. Most enrollees will complete the online degree requirements in approximately 2 years. Students with certain academic backgrounds may be able to complete the online MBA requirements in as few as 20 months. "My decision to pursue an MBA at St. Bonaventure University is one I will be forever grateful for and is one I recommend to anyone considering a graduate program. Some key benefits offered that made a difference to me: The flexible in-person and online class schedule A range of electives to peak your specific field of interest, including the option of a 2-week study abroad program in China through the Beijing Institute of Technology. The smaller, tight-knit class sizes that allowed an in-depth discussion to be had with peers and each professor. The communication and interpersonal skills gained in this environment are invaluable. Earning my MBA at St. Bonaventure has opened up a world of opportunities and the experience is one I will lean on throughout my professional career. "